Who better to deliver a healthy Italian cookbook than the nation’s favourite Italian chef? Gino D’Acampo reveals the secrets to inexpensive delicious Italian recipes in his much-loved, easy to follow style. Gino’s Italian roots mean his food is centred around a Mediterranean diet which is commonly reported to be beneficial to your health – those following it have on average a 30% lower risk of heart disease and stroke. A combination of fresh fruit, vegetables, a small amount of meat and oily fish at least twice a week helps to create a diet that is low on cholesterol, low in fat and packed with fibre. The dishes taste great and everyone is satisfied throughout the day. 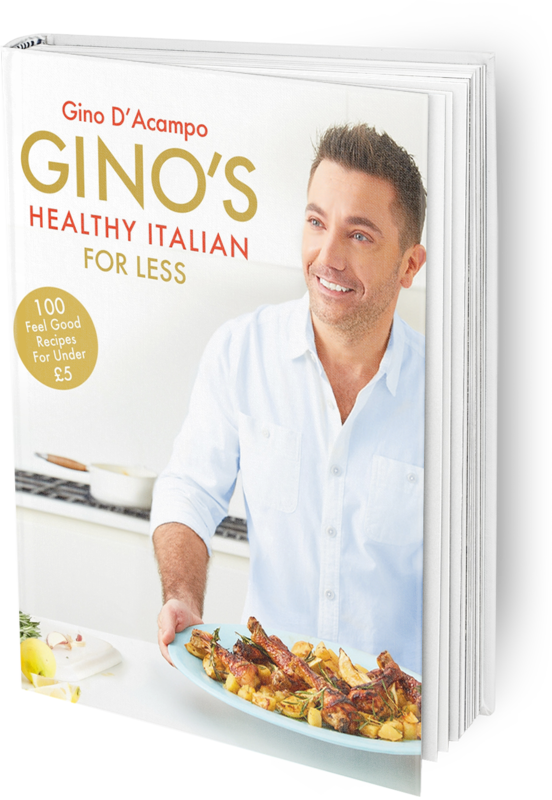 Full of money-saving tips and tricks for creating delicious healthy meals at home – Gino’s Healthy Italian for Less is bursting with the big Italian flavours of Gino’s signature style. Learn how to shop smart and store food, make the most of your fridge/freezer and fill your kitchen cupboards with fail-safe Italian basics. Bring down the cost of your weekly shop and start eating better than ever with Gino’s Healthy Italian for Less. Click below to buy Gino’s Healthy Italian for Less or to view recipes from Gino’s Healthy Italian for Less.